When Jill Lindsey worked freelance as a designer, she learned quickly that working to make other people’s dreams happen in an unsustainable fashion industry was not something that she wanted to continue doing. The idea of developing a concept store struck her, and in 2014, it became a reality. Of course, it didn’t come without its struggles and life lessons. Jill Lindsey opened her flagship space in Fort Greene, Brooklyn: a clothing store, cafe, bar, and wellness center all wrapped into one. A Passerbuys favorite, it has been recommended by Kalen Kaminski of Upstate, Jasmine Imani, and Donna Baxter who works there. Jill’s strong work ethic is evident as soon as anyone steps into the store. She glides around, moving from the garden to the bar to the clothing section, all while greeting customers to ensure a happy experience. In a space with a myriad of activities and selections for every customer, Jill inevitably remains the focal point. Customers can sit in the backyard garden with signature drinks from the bar, while the front of the store also provides seating among specially designed clothes, and the basement serves as the wellness center for everything from yoga to facials to psychic readings. We were invited to spend the day at Jill Lindsey in Brooklyn to experience a few of the services offered. The calendar of events released every month is filled with services provided by local practitioners. On this particular day, we were treated to a breathwork meditation session with Emily Mikaelah, founder of Helios and Solene, which was followed by a facial with Diane Avitable of Take Time Out For Beauty, an aesthetician and brow artist who specializes in holistic facials and brows. The women of the wellness center embody the same values and goodness that Jill Lindsey wants to spread in her community, which has inevitably grown and expanded. We spoke with Jill in her backyard garden on the perils of being a small business owner and how she is her own most reliable support. What is the origin story of Jill Lindsey, the person, who developed the idea of this unique kind of concept store in Brooklyn? I was in a point in my career where I was working in the fashion industry for a long time but I wasn’t fulfilled with what I was doing. I wasn’t making what I wanted to make. I was creative for other people, but not for myself. I was in Florence, Italy sitting at a wine bar thinking that I wasn’t meant to be working for these other people. I started writing what I thought was the most ideal thing for me to do. I love designing, hospitality, the art of coffee, hosting events, and bringing people together. I drew out what a store would look like in a notebook. How did you choose Fort Greene, Brooklyn as the prime location for a concept store? Given how rapidly this neighborhood has been changing in the past few years, how confident were you in knowing that customers will visit? I realized quickly that Fort Greene didn’t have a lot of options for gathering in the neighborhood, so it was the perfect place to build my store. I wanted something to offer everyone. The housing projects are right there, and famous people live nearby. To involve the community is to do so by talking. We do children’s sing-alongs, yoga, and arts and crafts. I wanted it to be a place where no matter who you are, you can come in and feel at home. I’ve always been someone who seeks out a hidden restaurant or goes on an adventure somewhere far away because it’s special. The people who are like that are going to find me. Then reality set in, and in the beginning, we would go days and only two people would come in. There was a point when I would stand in the street telling people to please come inside and see what we’re doing. People were really confused by a concept store. People couldn’t wrap their heads around it. For someone who didn’t have business experience, what did your timeline and business plan look like when you conceived of the project, since people may perceive of this idea as unusual at the time? In the beginning, I built the business plan by myself. I took one business class in college, and I used books and knowledge from that. I talked to friends who owned bars, and asked them how they got started. I had no other reference point. I thought about costs for rent, inventory, build out, insurance, and permits, so if I could save this much money, I would be able to make it. Then a friend gave me $30,000 that I could use as a loan or equity. I had three months of free rent, which is what anyone who’s opening a brick and mortar space should do. Get an abatement. I had three months to get the space ready and build this thing. I was getting the liquor license, restaurant license, food handlers, setting up business parts, and doing the buildout, all while still freelancing. Working twelve hours every day was a lot. In the end, I did it all for $94,000. I just hit the right spot financially when we opened. What was it like going through all those logistics and procedures as a small business? For the licensing part, I relied on my friends with the bar. Then I met with a liquor licensing lawyer because I didn’t know what to do if we just wanted to have beer and wine in the store. We had to go to food handler certificate classes and deal with the Health Department every year. I would get the same fines here, even though I’m a small business owner, as McDonald’s. For example, if they cite us for “too many flies” or a random complaint, they will fine $5,000. McDonald’s doesn’t have a problem paying for that. For me, that fine is more than our rent. I get really diligent, and I’m a super freak about cleanliness. Was there any significant lesson that you learned during those first three months that you wish you could have known earlier? I can’t say I would do it any differently because I’ve learned so much from it, but it would have been easier to have a team of employees. The level of multitasking that happens here is a lot. You’re talking to someone over here about a product, while making a latte, looking to see what’s going on in the front, and then planning the next event. There are so many things to manage. Having more hands on deck in the beginning would’ve been so awesome. When it comes to staying in business, how are you able to stay afloat financially during those first months? What are some tactics and skills that an entrepreneur needs to know when it comes to dealing with those struggles in the beginning? I feel like every entrepreneur just needs to trust, especially when you’re a brick and mortar. Things are going to happen. We had a really bad winter two years ago and nobody was coming out of their house. Nobody was coming to our events, getting coffee, or doing anything. It was so stressful. Something had to happen because we did not have enough money for rent in the account. Then the next day, it was the first warm day of spring. Everybody came out and shopped, and we made rent in one day which has never happened before. That’s why I just have to trust that the universe is going to watch out for me and I’m doing something for the good of the people. I’m trying to help raise the consciousness of retail and experiences. Now, after four years, we have a foundation of people that I am responsible for. We have more staff than I’ve ever had. It’s this fluid cycle of positive energy that has to be generated. Then you take those slow days to regroup, restock, check inventory, talk about events, and do all the things you can’t do when you’re busy. What is something that you would like customers to take away when they walk out of the store or come across your brand online? One of the reasons I stopped designing for bigger companies is because I saw the amount of waste that was happening in the fashion industry. From a futuristic standpoint, what was going on in the fashion industry was not good. They are basing collections on the weather. The weather doesn’t matter anymore. Global warming has screwed everything. The business platform of the fashion industry was being run on something that didn’t make sense to me, but if I could make whatever I want, seasonality isn’t going to matter. At first, I started working with artisans in Nicaragua to make sandals. All of the shoes and leather used for the sandals were coming from extra leather from factories, which is a sustainable way of doing things. Then I started working in Manhattan with a couple, and we make all our clothes there. We sell so many local and small designers that I saw how hard it is to be a business owner. If we could partner with these people and they could get more business from doing a collaboration with us, then we’re going to make money because I’m going to sell the product we made together. We did that with Izaskun Zabala who’s a local jeweler. 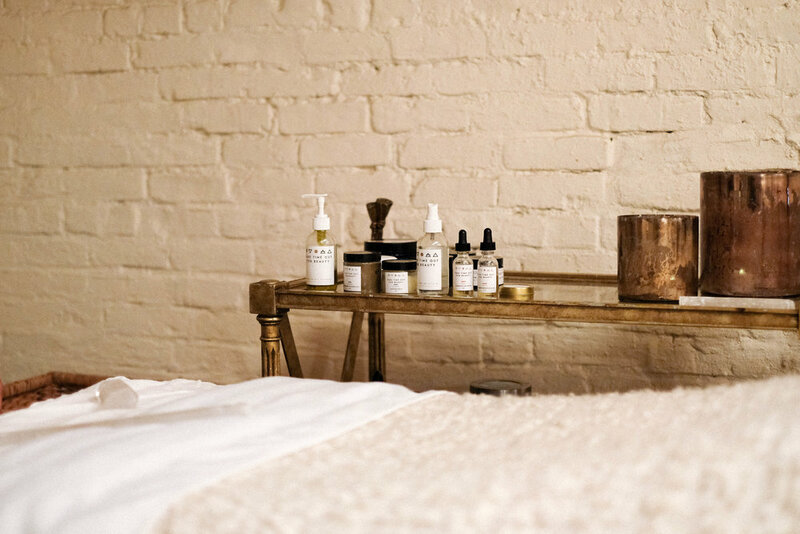 All of these skincare brands are focused on sustainability and non-toxic ingredients. It just creates more of a family foundation for what the business is. What are some resources that you used that you now recommend to someone who would like to start a small business? Two years in, I got a small business loan which helped on so many levels. It helped us get inventory. It helped me expand when I opened a location in Malibu, CA for a year and a half. It helped us do a pop-up in Canal Street Market. The Small Business Association is really great to talk to, and I think it’s very important for anyone. Even if you’re not going to get a loan, just talk to them. They have financial workshops and banks that can offer different types of funding. I’m also a very keen watcher of the way businesses run. At Canal Street Market, for example, I realized three months in, that our location there wasn’t going to be a permanent place for us because the energy wasn’t there. I also base a lot on hotel hospitality. At one point, after I opened this, I was going to open a Jill Lindsey hotel down the street with a couple of partners. It was an exercise on having partners discuss what the project would be like and how much money we would have to make there. I realized that that’s not going to work for us. It just wasn’t a big enough space to actually make money. I’m constantly being creative with finance. When starting Jill Lindsey, you didn't work with investors, and as you mentioned, working with those partners on that project did not work out well. Was that a conscious choice in ultimately not choosing to work with people who had differing ideas or beliefs? I’ve learned a lot of lessons from partnerships. I tend to not work well in them and that my vision is really special. I tend to have beliefs and practices that are not normal. Most people are in entrepreneurship to make money. For me, as long as rent is paid and I can have a decent life, I’m not in it to make tons of money. I’m in it to change people’s lives and spread education and happiness through experiences with people. I have to just believe in that. Those partners know I’m successful and want me to do the work, but they want it the way they know how to do it. That gives me confidence that what I’m doing is meaningful and works. With all the work that goes into a multifaceted but intimate space, how do you stay balanced and vibrant for the customers that come in every day without getting drained? It’s interesting that you bring up getting drained. The first Christmas Eve that we were open, we got slammed. I didn’t realize Christmas Eve was the busiest shopping day of the year because I don’t have a retail background. Then when I got home, I just melted into my couch. It was the first time that I realized my energy had been pulled in so many directions that I needed to protect it. I do meditate. I love traveling. If I can take two days to go somewhere, that helps. I find time outdoors, so I go to Fort Greene Park and sit, or go for a run. I get a lot of our healing services, like Reiki meditation once or twice a month. We have a woman come in who teaches how to protect your aura. I also get to relax because of what I provide in the store. Do you have any advice for women like yourself, who have so many interests and want to pursue a career with their own unique business? It is nonstop! It is work all day and every day. No one’s going to do it for you. You have to really love it. Unless you have an abundance of money and an entire management team, which wouldn’t be a small business, everything would change. If you want to work in a brick and mortar, then you have to know that when you open, you’re going to be there every freaking minute, especially if your name is on it. No matter how much your employees are dedicated to you, the only person you can ever rely on is yourself. I have to be really quick to make decisions, lead people, come up with ideas, and coach everybody into the business that we do every single day. What are you favorite or reliable places in New York to wind down or get inspired? When I first started making enough money, I would take myself out to dinner or lunch dates alone as part of preserving my energy. I would go to ABC Kitchen or Cucina. I would go at 5:30 PM and sit by myself with a drink and meal to treat myself. I love Buvette in the middle of the day with a glass of wine and snack. I love hotels. Sometimes I’ll just go hang out at The Carlyle. Parks are really nice. Picnicking is my favorite thing in the world. If I need a yoga class, I’ll go to Laughing Lotus in the city or Sky Ting, but we also have pilates classes here in my store. Still, my home is a sanctuary. It’s so great and close, and it makes me feel comfortable. What’s next for Jill Lindsey? About two years ago, I realized that what I was doing was so different and special and meaningful that there needs to be more of them and on a bigger level. We don’t have enough space for all of our practitioners in the Fort Greene space to do what we really want. I want to continue to grow our brand by categories and locations. We’re currently in a lease in Tribeca that might happen, which will be a store, cafe, and wellness center. I definitely want to open in California, the Midwest, and Europe. I think partnering with the right types of hotels is a good idea because of new programming. I’m manifesting the right mega investors with that. Oh, so you would be willing to work with investors now? I think I have to. I’m good at curating a space, people, experiences, and operating all that, but I would love the help of experts to help me grow, from legal, financial, and administrative support. I think about it on a daily basis. There are all of these chain places that people are going to. If we can charge a little bit more money to have things that are hyperlocal and supporting local communities, wouldn’t that make a better story for the whole world?